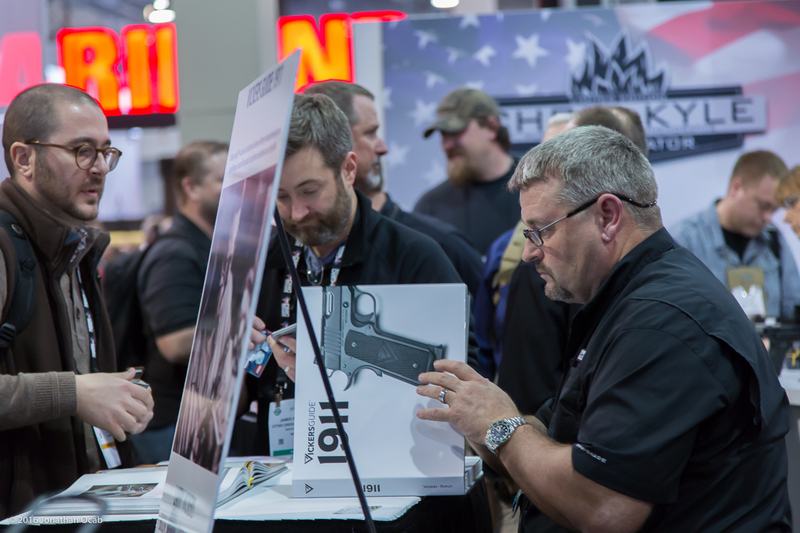 Whenever January rolls around, that means SHOT Show and 2016 is no different. Held again at the Sands Expo in Las Vegas, the home of the SHOT Show through the year 2020, there were over 1,600 exhibitors on hand to match the expected 60,000+ professionals attending the show. As I have since 2008, I made the trek out to Las Vegas to attend the show. 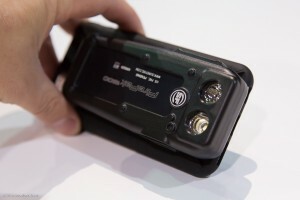 While SHOT Show is a massive show, and there is just too much for one person to cover, I wanted to report on a few things at the show that I encountered. 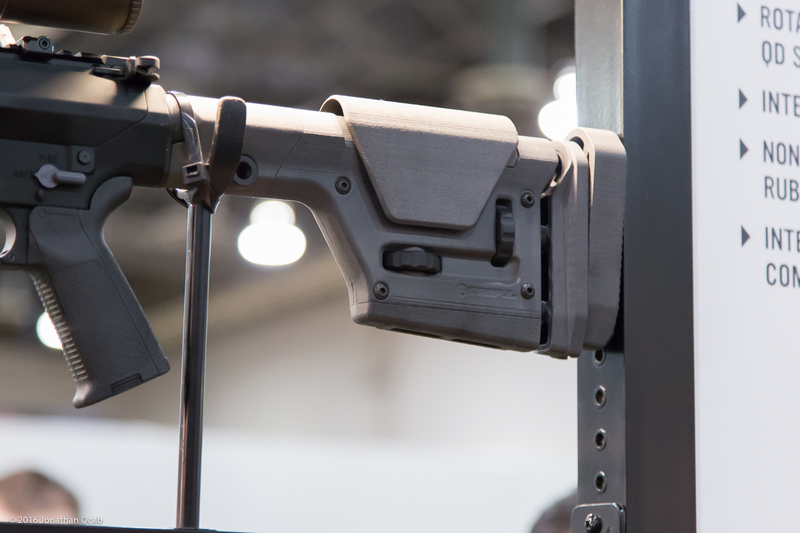 MagPul had several new items being displayed at SHOT Show this year, including more in their soft goods line (gloves and belts) and magazines, but two specific items of note were actually announced pre-SHOT show: the UBR Gen 2 and PRS Gen 3 stocks. The MagPul UBR is a highly coveted stock for several years now. Of all the products I saw at SHOT Show, this item I analyzed the most since I have a vested interest in it since I own a UBR. While heavier than most of their other stocks, the UBR is very tough and durable, and the design blends the toughness of a fixed A2 stock with the adjustability of a collapsible stock. But the price point of the UBR caused some to shy away from it at $265 MSRP. But with the new UBR Gen 2, MagPul has been able to decrease the price of the UBR without sacrificing durability or ruggedness, while at the same time decreasing the weight and adding some new features. The UBR Gen 2 receiver extension has changed from the original UBR which means that the UBR stock will not attach to a UBR Gen 2 receiver extension and vice-versa. Also, the UBR Gen 2 stock ‘claw’ attaches to the receiver extension in a less complex manner. The original UBR has a claw/switch on the bottom of the stock that is used to move the stock back and forth. In order to remove the stock completely from the receiver extension, there is a crossbar switch that also needs to be depressed one way to get it past the lock stop, and depressed the other way to get it off the extension. 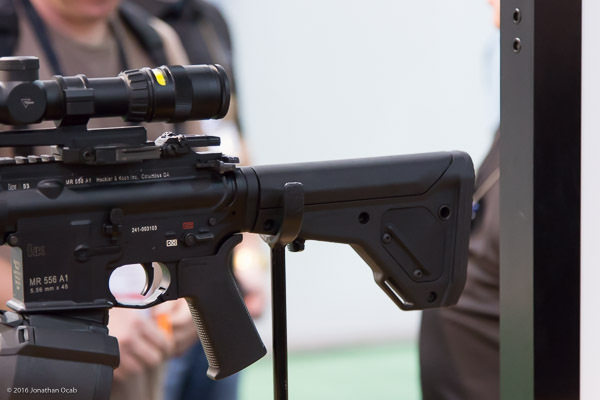 The UBR Gen 2 appears to have eliminated the crossbar switch and all adjustment and removal of the stock on the receiver extension is handled with the single claw switch. When I handled it in person, I didn’t ask for help on how to operate and strip the stock from the extension, and reattach the stock to the receiver extension, but I was able to figure it out in a few seconds (having already owned and operated the original UBR). Another notable improvement is that they now include sling cups on both sides, not just one side (reversible), but also, the sling cups are anti / limited rotation. I had to modify by UBR to add a limited rotation sling swivel cup, and now UBR Gen 2 buyers will not have to do this. Not to mention, MagPul also added an integrated ASAP QD sling point, which is essentially a receiver end plate sling mount point, which is ideal for single point usage. So with all these exciting new features, is the UBR Gen 2 a must have? If you don’t already have a UBR and wanted one, I think the UBR Gen 2 is definitely a buy. The price dropped nearly 25% and they improved it. Not much more to say there. But if you already have a UBR now, I would say only upgrade if you need either the weight savings (5 ounces less ), the extra LOP, or the end plate QD sling mount. The extra 1″ on the maximum length of pull might be desired for all of you tall folks. As far as the anti/limited rotation sling swivel cups, that’s something you can already add on to your existing UBR (as I have already done). Anyway, I anticipate we’re going to see a lot of UBR Gen 2 units being sold when they are released in Summer 2016. I might actually get one because I have been pondering going with a 2-to-1 style sling to utilize a single point for weapons manipulation scenarios, and the UBR Gen 2 accommodates this with the built-in ASAP QD mount. Plus, the weight savings and extra adjustments sound nice. The PRS Gen 3 is another notable new product from MagPul. The PRS typically used on more precision based AR platforms such as an SPR-style or a .308 or larger caliber/cartridge AR. The major change from the PRS to the PRS Gen 3 is the fact that there is now one single PRS model / SKU that will adapt to either a standard AR or a .308 based AR. No more picking a .223 or .308 PRS and only being able to use it on that specific platform. Note: The PRS Gen 3 in the photo is a 3D printed prototype, hence the rough finish and look. The other significant change is that the PRS Gen 3 has an adjustable buttplate/pad. If my notes are correct, it will be vertically adjustable up to 1″ (up or down) and have a cant adjustment of up to 5 degrees either way. This might not see like much adjustment, because it really isn’t, but every little bit helps for prone shooting. From what I was told, design limitations on the stock prevent a greater degree of buttplate adjustability. The MSRP remains the same from the PRS to the PRS Gen 3 ($255 USD) and the PRS Gen 3 is slated for a Fall 2016 release. 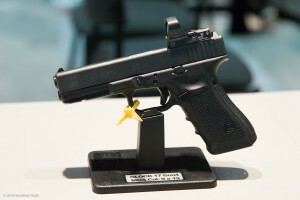 Everyone’s beloved (or hated) manufacturer, Glock, had a fairly uneventful SHOT Show this year, albeit on their 30th Anniversary. The pre-SHOT announcement were the Glock 17 and Glock 19 MOS Gen 4 pistols. This is essentially the Glock Modular Optic System that was debuted last year, which utilizes Glock’s own system to attach a micro red dot sight to the pistol slide. 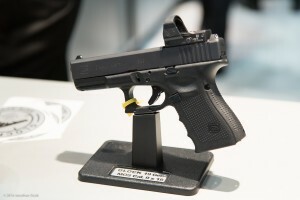 The only other item to note from Glock was a very quiet reveal of the Glock 36 with light rail attachment. They only had a small flyer indicating this new model feature and didn’t even have a demo model on the floor. When asked, a representative said they just found out about it at the show and had no other details to provide. I anticipate this is in response to the recently released SureFire XC1 compact weapon light. 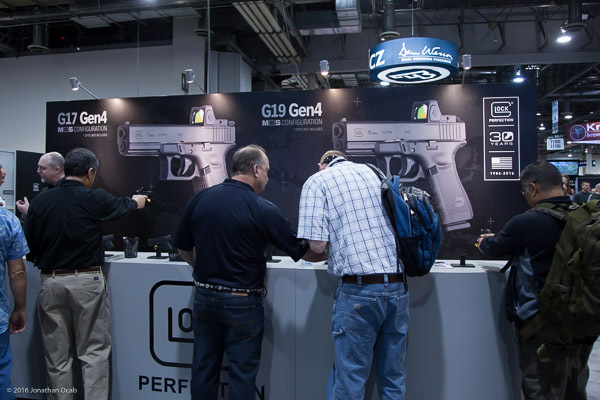 All in all a ho-hum SHOT Show for Glock. But where else can Glock go at this point? Speaking of SureFire, they only have a couple new items in their product line of note (aside from improvements to existing products). One of which is their new Sidekick accessory light. It is basically a keychain light, but with levels of output: 5 lumens, 60 lumens, and 300 lumens (45 hours, 4 hours, and 1 hours 25 minutes runtime, respectively) and a beam range of 66 meters. It has a built in (non-removable) lithium ion battery, and the unit is USB charged. 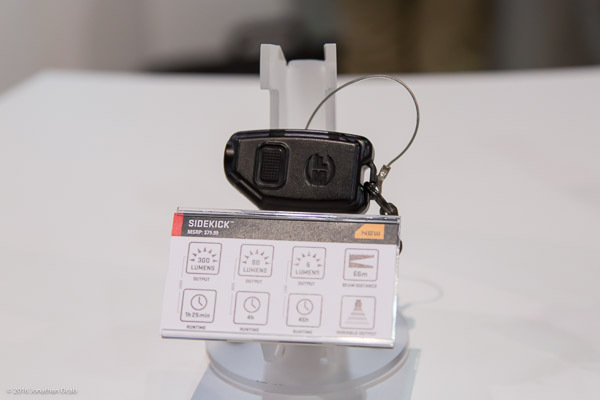 The Sidekick has carries an $80 USD MSRP, which is expensive as far as a keychain light is concerned, but being SureFire, you’re paying for the name (recognition, support, and quality) that backs up the product itself. The other notable new product is the SureFire FirePak. 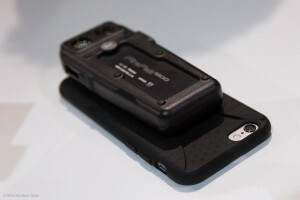 The FirePak is both a phone charger with a light that puts out 1500 lumens maximum output. 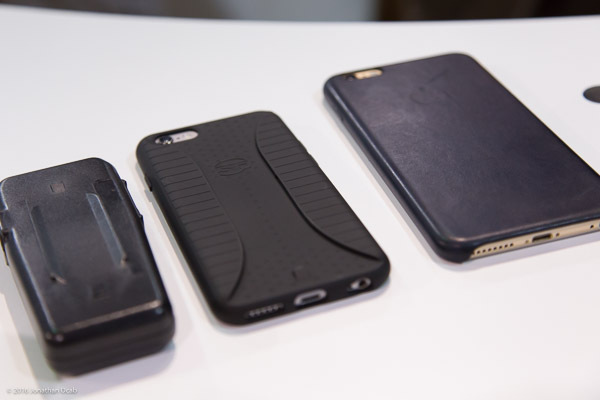 The light itself docks to a proprietary SureFire smart phone case (iPhone 6/6S, iPhone 6+/6S+, or Samsung Galaxy 5), but will still need a cable connector to charge the phone (although, a built in connector remains to be seen). 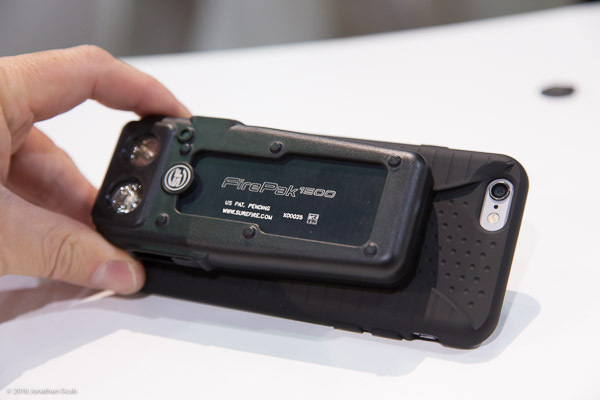 The FirePak can be controlled from the phone with a smartphone app via Bluetooth, or manually controlled using slider controls on the FirePak. This is a very niche product, and I am not sure who SureFire is trying to target with this product other than iPhone photographers and videographers. While docked to the phone via the SureFire phone case, there’s about a 3″ to 4″ offset of the light from the camera lens (distance will vary based on phone), which is probably just small enough off axis distance to make decent usability for photos or video. I feel the FirePak is a product that won’t see any sort of widespread usage, and with an MSRP of $249 USD, it is very difficult to justify getting one just to tinker around with. Larry Vickers signing copies of the Vickers Guide: 1911 book, wearing a nice 50th Anniversary Rolex Submariner (16610LV). Visit the site again soon or follow my Twitter or Instagram feed to read Part 2 of my 2016 SHOT Show After Action Report which should be posted shortly. 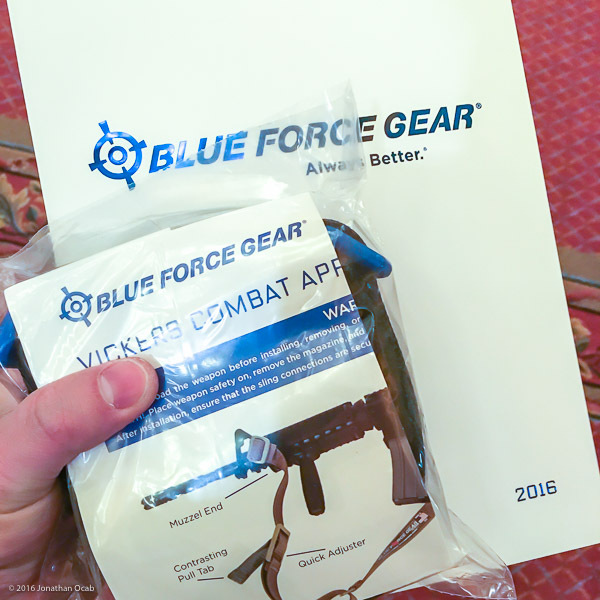 Special shout out to Blue Force Gear for the 2016 SHOT Show exclusive Vickers Combat Application Sling with blue nylon hardware.